Male tattoo artist showing the process of making a tattoo on arm. Picture: iStock. Is removing your tattoo deleting your history? In 1975, the Skyhooks famously lamented that all their friends were getting married. More than four decades on it seems the same cohort of society have replaced weddings with something altogether more painful - having the tattoos of their early 20s erased via laser removal. Not quite as catchy a tune as that of the 'Hooks, but a similar sentiment all the same. According to recent data from McCrindle, one in five Australians now have tattoos. Within that group, 52 per cent have more than one. It's somewhat unsurprising, then, that 27 per cent of people with tattoos say they regret their decision to some extent, and that 15 per cent have either looked into or begun having their tattoos removed. Like most things in life, people get tattoos for all sorts of reasons. To mark a period of their youth; to honour the memory of a loved one or a profound phrase they once read in a bathroom cubicle; to prove their an unwavering devotion to their favourite band. 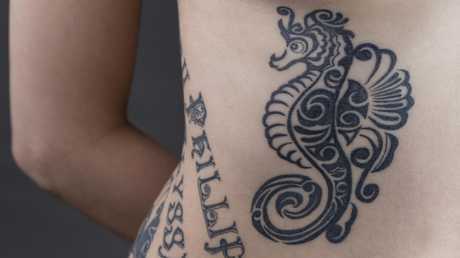 And if you're in the 20 per cent of Aussies who have a tattoo, chances are your predilection for ink started when you were relatively young, and when your taste levels could best be described as bad. But if sunlight is the best form of disinfectant, then time is the enemy of the tattoos of our youth. "I had 'everything's not lost' tattooed on me when I was 24. I thought it was deep and meaningful," a friend who underwent laser to have it removed a few years later recently told me. "I decided to get it taken off because it's rubbish, and my family would give me the most stick about it." Another woman who is currently having two of her six tattoos lasered off said she'd made the decision after seeing how badly they were ageing, and simply no longer liking them anymore. "I got them both done when I was really young and I didn't really know who I was yet," she told me. I too have skin in the game; a bad tattoo of my own taking pride of place on my body. When I was 19, my best friend and I found a walk-in tattoo parlour via the Yellow Pages, handed over $100 to a man named Daryl (who seemed to despise everything about my friend and I except our money), and asked him to ink us with matching black stars. I wanted to be just like Gisele Bündchen so opted for mine to be tattooed my left wrist, whereas my friend had hers tattooed behind her right ear. Sadly, the addition of said star to my wrist did not make me look like Gisele Bündchen at all. Rather, I still looked just like me, but with a permanent club stamp. And the best friend I had entered into this lifetime friendship pact with stopped talking to me about six months later over something to do with a boy that I can no longer remember the particulars of. And yet, every time I think about having it removed a sense of nostalgia washes over me and I find myself feeling weirdly attached to this thing that visually repulses me, but is such a minute reminder of the carefree idiot I once was. One with slightly questionable taste in tattoos, but one I somehow now have a lot of affection for, too. And so I close down all of my browser tabs and save the decision for another day. Maybe one day it'll be lasered off, but until that day comes I guess I can always just wear a watch.